This is a generic control platform where Alian Elect can apply programming of your choice, or if you are familiar with Atmel microprocessors, experiment with your own software. 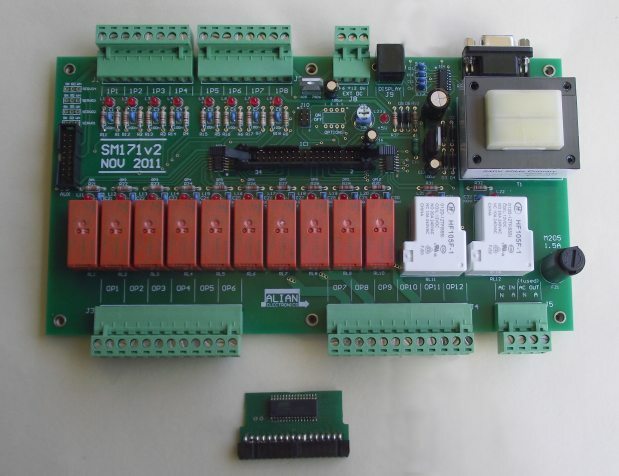 Comes with a test program where 12 inputs activate 12 outputs & echo the result to the serial port. The microprocessor used is the Atmel AT90PWM3, which is a surface-mount device that plugs into the main board via a 34 way connector. The board (including terminal blocks) is 240mm x 145mm x 45mm high. The SM171 is also available with a standard Relay-sequencer program. With this configuration of the SM171 module features 8 relay outputs and one override input. There are two adjustable time delays that affect relay operation. The OFF time adjustment affects the interval between relay operations. The ON time adjustment affects the duration of each relay operation. Only one relay at a time will operate during normal operation. After the 8th relay has operated the unit will cycle to the first relay. The price of the SM171 with this program is the same as the generic controller, but LCD display (SM264) and plastic enclosure need to be ordered separately. The SM171 features its own 240V power supply, sufficient to power the module and and any connected LCD display. The 240V supply may be extended to auxiliary screw terminals via a 1.5Amp mains fuse. This supply may then be extended through any of the 12 relays as required. There are eight digital input ports that connect via screw terminals. These are normally intended for connection to external switches or control contacts. Eight status LED indicators show when these inputs are active. An additional four inputs appear on a 4 Way Dip-Switch on the PCB and may be used for option settings. The 4th of these Dip inputs is also an Analog input, which is applied to a trimpot mounted on the board. This trimpot can be used for an analog adjustment for time delays etc. A separate 20-pin IDC socket also connects directly to all inputs in the event that a rapid connection to a separate daughter board should become necessary. Four of the Digital Inputs also appear on standard 3-pin headers to support small servomotors. (These are the low-cost generic servo motors available from Jaycar Electronics etc.) A separate 6Volt regulator is located on the SM171 board to power the servomotors. These motors may be moved to any position in a 180º radius with precision control when appropriate driver software is written to accommodate them. There are twelve relays connected to the microprocessor. Each relay has a red Status LED indicator to show the state of each relay. Ten of the relays are 10A, Normally Open contacts and two of them are 30A Normally Open contacts. Connections are via unpluggable 15A rated screw terminals. A DB9 port is provided to connect to an RS232 port from a standard PC connection. Only a null 9-wire to 9 wire patch cable is needed to complete all connections to a PC. Standard RS232 line drivers are present on the SM171 board to provide good compatibility with other systems. This board can be used as a platform for many different applications. Dedicated programs may be produced on demand for specific applications. A standard demonstration program is available that will allow all 12 inputs to drive all 12 output relays. Input and relay status information is also transmitted to the serial port each second at 1200 baud. SM171 12 Relay Control Module - Assumes all relays and features are required.